Wow! You made it! I bet there were times when you thought that you’d never get there. You’ve studied, passed exams, graduated and now you have scored your very first job. Congratulations! Don’t let it all go to your head though, it’s really important to know how to make your first post-graduation paycheck count, so here are some tips. It is vital to your future success and security that you don’t blow it at this point. It can be so tempting to let success go to your head, to think that there’s plenty of time to get serious, that your future is a long way off, you’ve got plenty of time and to spend all that first pay check and the next one and maybe many more after that. Unfortunately, that is the problem; it has been shown that those who live the high life after graduation, without making any provisions for the future, find it much harder to settle into a plan that will ensure a secure financial future. It’s easy to think that you have plenty of time; to have the mindset that you’ve worked hard and so you deserve to relax and have some fun; that you’ll get organized about the future next pay check; and so the list goes on. When it comes to responsible and effective financial management, it pays to start the way you mean to go on. It makes the process so much easier and there are no painful adjustments to make later. Now is the time to plan your financial future, not down the track when you realize you may have left it too late. The first thing you need is a personal budget. You need to know how much money you have coming in and how much needs to be paid out and to whom and by when. Trying to keep it all in your head is a recipe for disaster. The only effective budget is one that balances and is written down. Anything else is not a budget but fantasy. So set out a personal budget for yourself, either as a computer spreadsheet or on paper. Include all forms of income and divide expenditure into categories like rent/mortgage, entertainment, household expenses, insurances, transport etc. Put a dollar amount against each entry, estimating if you don’t have any past figures to go by. Add all income in one column and then expenditure in another. Subtract expenditure from income and there should be a positive balance. If not, you need to shave some expenditure items. A budget is a document-in-progress, so be prepared to adjust it as circumstances change. To make your first paycheck really count, you need to make room for some savings and a contribution to a retirement plan. Many employers offer some type of retirement plan so you need to make enquiries at work as to what is available. Sometimes there is a probationary or waiting period before you can set up an account but the great thing is that many retirement plans include an employer contribution so it is well worth having one. It may seem strange to be talking abut retirement plans when you are young and fresh out of school, but the sooner you start paying into a plan, the greater your future financial security will be. Even if you start with a small investment of even $50 from every pay, it will add up to a sizeable amount over the years you will be working. When you get a pay rise, you increase the amount you put into your account. Another important aspect of your budget should be an emergency fund. None of us know what the future holds and if you get sick or have an accident, you need to have money available until you can return to work. Research has shown that most people these days only have enough funds to maintain their current lifestyle for about 30 days if they were unable to work. Don’t put yourself in this position; gradually pay into an emergency fund until you have the equivalent of at least six to twelve months income, as a minimum. Of course, as your circumstances change, you may need to increase the amount you have in your fund. If this money is invested in an interest-bearing account, it will be working for you by providing interest. You are working to fund your lifestyle and to achieve your goals, as well as to enjoy a rewarding career, so make your first post-graduation paycheck count by starting off the way you mean to carry on. Consider this first check as the stepping-stone to the rest of your financial life; as a strong beginning to help you to achieve everything you want in life. Very well said, this is a great post for the new grads out there! And even some people that doesn’t know how to save. This is a very good point to save earlier the better. Hi there, company pension schemes are great especially when they match contributions. They are basically giving you free money so why not take it. I have to admit the company pension scheme that I’m currently in is not as good as my old pension in the UK. Benefits however are an added extra here that you very rarely receive in the UK. There is always a toss up I guess from place to place. Some pension and benefits sounds good to me. Great post. 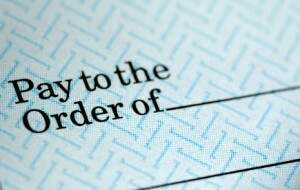 I think most grads will be celebrating with their post graduation check. I know I did. It’s so important to start off your finances off on the right foot….how a young person handles their first “adult” paychecks may set the tone for their entire life! I agree. Looking back I wish I would have done some things differently. Way back when I graduated from college and got my first job, I was living in the spare room at my older brother’s house. I eventually got my own apartment, but continued living like a college student for several years, with cinder-block and hand-me-down furniture from friends. I put in the correct percentage into my retirement funds starting with that first paycheck to max the withholding every year. Good for you Bryce. One of the hardest things is to keep living small even when your income goes up. Too many keep spending and they end up in debt that could have been avoided. This is CRITICAL to new grads coming out into the new world. I was oblivious and stupid for not taking even some slight seriousness to my income when I first started to make some money. I completely regret it. As I age (29 now), I try to not tell “youngsters” what to do rather what I wish I would have done. Hopefully, they listen and take that advice to heart. Great, much needed article Miss. T.
I agree. I think we can all learn from our past decisions. The key is to try to change our ways as early as we can so we can get the most benefit.